In New Jersey, and the rest of the mid-Atlantic, we have two newly invasive fruit flies that attack grapes including wine grapes. My lab is currently working to determine the impact these insects will have to the berries and to yield. SWD is different than other ‘vinegar flies’. Males have a black spot on the end of each wings for easy identification. Females lack the black spots but have a large serrated ovipositor that allows a female to lay eggs in ripening fruit – ie. fruit that is not rotten. The larvae develop inside the berry, which causes it to “melt”. SWD has a very short life cycle that can be completed within 10-15 days. SWD has become a significant problem in other NJ berry crops but our IPM programs are able to effectively manage them. 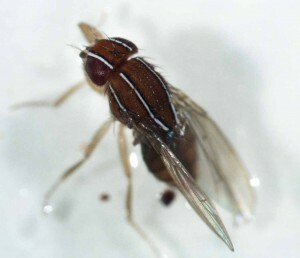 AFF is an invasive and possibly opportunistic fruit fly. This is a beautiful fly with a bright red thorax that has dominant white stripes. As they remind me of racing stripes, I like to call it the Nascar fly! This species does not have a specialized ovipositor but we are unaware of its potential as a pest so we have included it in our surveys. We are currently working to determine the impact of SWD and AFF to wine grapes among select varieties. Although this work is currently ongoing here is an update on our findings thus far. To determine the presence and abundance of SWD infestation in NJ, 100 grape clusters across five grape varieties (Merlot, Pinot Noir, Chambourcin, Chardonnay, and Cabernet Sauvignon) from two southern New Jersey wineries were harvested in late August and early September (8/22-9/5/2013). Fly presence in clusters was determined by allowing any fly larvae to pupate and emerge for adult fly identification. From the 100 clusters, 9 produced SWD (four Merlot clusters, two Chardonnay clusters, and three Cabernet Sauvignon clusters) ranging from 1-3 flies/cluster. SWD presence has remained mostly constant over the sampling period, with a slight increase in early September. Additionally, one Chardonnay cluster was also found which produced five AFF. Sampling of clusters will continue through harvest follow changes in the abundance of fly infestation in southern New Jersey wine grapes. To identify possible impacts on grape quality we are taking measurements of Brix and grape chemistry to determine if changes occur due to an infestation. As I have said before, both pests have the potential to decrease yield and increase secondary pathogens such as sour rot. To summarize, we are finding both invasive fly species, especially SWD, in wine grapes – supporting data from 2012. However, these populations are still at low densities and we are unaware of the potential impacts and not recommending management at this time.